The Pumped-Up Pets Package includes a deluxe room, workout tips for both humans and their pets, a Zisc dog Frisbee, and a specially created “Scratch My Flat Belly” meal for pets. The Pumped-Up Pets Package is available at 17 Loews Hotels in the U.S. and Canada from now through May 1st, 2010. Rates vary and are subject to availability. 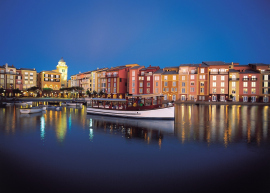 Two of Orlando’s Loews properties are offering this special pet package – the Loews Portofino Bay Hotel and the Loews Royal Pacific Resort – both on Universal Orlando property. All of Loews hotels are pet-friendly and guests (the four-legged kind) receive special gifts at check-in including a pet tag, a bowl and of course, a healthy treat! There is a one-time pet cleaning fee of $25 and a maximum of two pets per room are allowed. For a complete listing of their pet rules, visit the Loews Hotel Pet Policy. For more information about the Orlando resorts, check out my article on Examiner.com. If you need assistance with your travel plans, please don’t hesitate to contact me. I am a travel agent specializing in pet travel. My small dog, Bodie, goes with us on every trip we take and so far has been lucky enough to visit 12 countries! Next post: Guest Post on ‘How To Travel With Pets’!